How much pressure am I under!!!??? Ok so in light of the fact that fuel pressure is very, very important to fuel injection operating correctly. I decided to get a digital fuel pressure gauge for the car. With old gas tanks, and aftermarket parts and fuel system, you really don't know how the car is going to react. Rather than guessing what it is, or if something is going wrong, I can take fuel pressure out of the pool of questions. I also wanted to see the change in fuel pressure under different driving conditions. 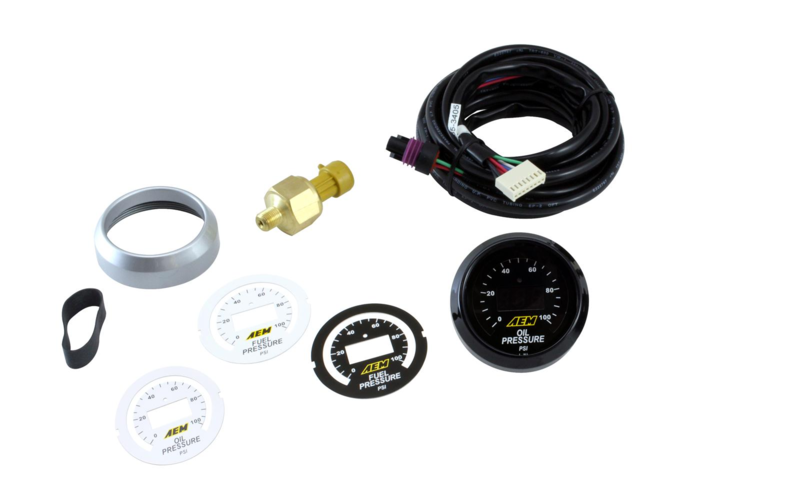 Worst case scenario, I replace my existing oil pressure gauge with this one, as it matches my current AEM afr gauge. The Sniper EFI allows you to manually correct for actual fuel pressure in the software. So it can factor in pressure that may be slightly higher or lower than the desired fuel pressure of 59-60 PSI. The -6 to -6 fitting will also help because the existing -6 coming from my tank will be too short, as I realized only later that the fuel inlets will be facing forward. If this thing does work then I will likely replace the pump with a returnless in tank unit when I get my gas tank re-done. At some point in the tank's history, the bottom was dented in, not enough to really worry about, but it still needs to be addressed. So this morning while I was having my coffee I came up with this from Summit. I'm assuming the Holley unit has its own fuel pressure regulator on there somewhere, but is it vacuum compensated? Most FPRs (that I'm used to) have a vacuum line going to them so the the pressure drop remains CONSTANT between the fuel pressure in the rail/top side of the injectors and the intake manifold, regardless of the manifold pressure. I say all this just to warn you to not be surprised if you see changes in the absolute fuel pressure when you open/close the throttle, as that's just the FPR reacting/adjusting to the changes in the manifold pressure. I suppose it would also be possible to leave the fuel pressure constant in absolute terms, and then just adjust the injector fueling times further to compensate for the MAP deltas, but I don't know of a setup that works this way, so it'd be interesting to know if that's how the Sniper works instead! Great question, the answer is that it is not vacuum referenced, so that is why they are very particular about the fuel pressure. Even in the software, it allows you to manually tell the computer it has a specific pressure.